I never know when we are going to get a Lost Ring Hunt phone call. I monitor the website analytics on the www.LostandFoundRing.com website almost every day, so sometimes I can anticipate a phone call if I see someone viewing certain pages. I can also see if someone came to our website through one of the Google Ads I run trying to find people looking to rent a metal detector. However, I can never totally predict when a call will come. This was the case with Justin’s lost ring. We were out to eat for Father’s Day with my wife’s family when I got Justin’s call. This wasn’t our first Father’s Day Hunt, check out this Lost Ring Story from Devil’s Lake State Park from a year ago. On the call, I learned that Justin’s ring was lost while playing sand volleyball. While hitting a volleyball, his ring flew off and hit the metal awning hanging over some tables that were setup next to the court. Some friends sitting at the tables heard the “clang” of the ring hitting the metal. Amazingly, even though they knew how and where the ring was lost, no one could find the lost ring in the sand. 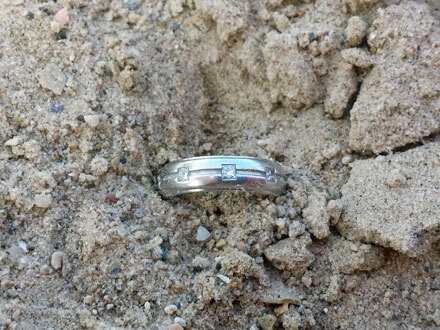 It’s amazing how fast a ring can go out of sight when dropped into fine sand. A group of guys had an idea to rent a metal detector to see if it could help find the ring in the sand. However, it was Father’s Day and no places were open who rented metal detectors. After some web searching, they discovered that Cabela’s sold a number of different metal detector units. They were desperate and buying a metal detector, even for just a single use, was their only option. Or was it? 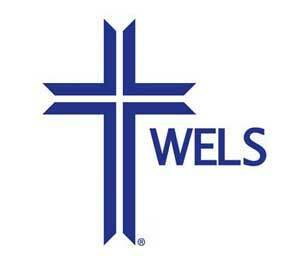 After a group of guys jumped in a car and headed over to Cabela’s, someone else continued searching the web – and he found our website and an even better option. Why rent or buy a metal detector, when you can hire a metal detector professional? 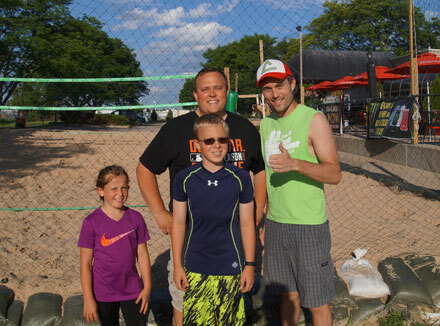 After hearing the story, I agreed to meet Justin to help find his lost ring in sand volleyball court, and he agreed to call off his friends who were headed to Cabela’s to buy a metal detector. Given that he knew he lost it on the volleyball court and it was within the past hour, I was confident that we could help. When we arrived, we got a reenactment of how the ring was lost, and began our search. After pulling out a couple pieces of junk, we got a good signal near the edge of the court. We pulled out our small metal detector, called a pinpointer, and quickly located Justin’s lost ring. If you are reading this and lost your ring today, last weekend or 10+ years ago, please give us a call at (608) 492-1070. Write down as many facts about how and where you lost your ring. These are so important and can be the deciding factor in whether your lost ring is found or will remain lost forever. Please “Like” our Facebook page and you will get every Lost Ring Story delivered to you. Also, please share this story on your Facebook page, so together we can reach more people to help find their lost rings. Remember, every ring has a story, what’s yours?